It’s cold at night, windy in the day, and the ski season is over. What’s a Montrose local, who is looking for adventure, to do? 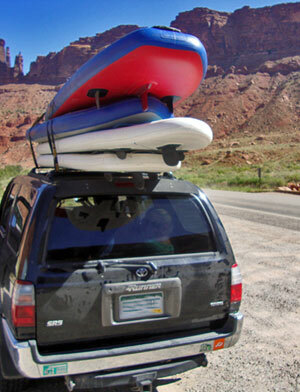 Get your rear to Moab Utah and go for a paddleboard trip. Now we used to think the whole stand-up-paddle (SUP) scene was kind of mellow. But take a paddleboard on a river and you have whole new experience. Rather than the typical lake float that’s synonymous with a pontoon barge tour, river boarding can be challenging and really fun. 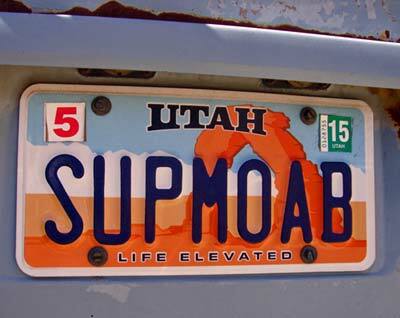 Because Montrose is still relatively cold in the spring, we’re highlighting Moab Utah since it’s the warmest destination near Montrose Colorado. 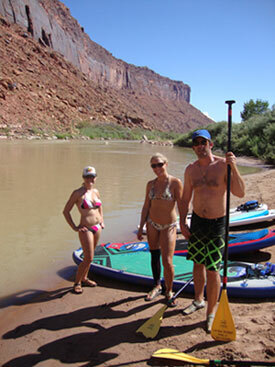 The class I & II “Daily” section in Moab is the perfect place to elevate your paddle board skills to the next level. The first river section to paddle is below Moab. You can paddle the Potash Road section (class I), which is akin to a moving lake with really cool views of sandstone canyons. This is great for those who have paddled on lakes and are looking for their first river paddle experience. The second river section is located above Moab. You can paddle the more-intense class II section starting at Takeout Beach or Sandy’s beach (see river map). The class II run is below the Colorado River “Daily” section. Don’t get too cocky though, you need ninja level balance to not fall during the numerous rifles and rapids throughout this section. The water is warm and the outside temps are warmer starting late spring early summer, making falls in the water actually fun. Hire a guide from Canyon Voyages if you’re not an expert. You can actually get hurt from falling on rocks and possibly drowning. Hire a guide who knows the river and who can outfit you with the boards, proper gear, and safety equipment. With that said, this section is super fun and very scenic with 1,000′ cliffs above. This is a perfect spring trip, especially when you desert camp and head to Arches National Park or Canyonlands the next day. Moab Utah is only 3 hours from Montrose Colorado so go have some river fun and maybe get good enough to paddle the Uncompahgre River through Montrose? Have Questions about Ouray or Montrose Colorado Real Estate?